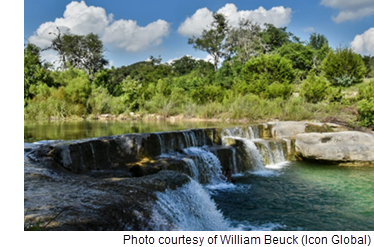 ​​​​PIPE CREEK – A 5,000-acre ​Hill Country ranch—complete with abundant wildlife, a spring-fed creek, and several lakes—is on the market for $49.95 million. Northrup Pipe Creek Ranch sits six miles west of Boerne and 25 miles northwest of San Antonio. The property is surrounded by 6,000 acres-worth of privately owned ranches, and is situated next to 3,000 acres of state-protected wilderness. The ranch spans Bandera, Kerr, and Kendall counties. The Northrup family has taken measures to ensure the environmental protection of the land by implementing conservation programs and getting the land certified as USDA Organic. The family has owned and operated the ranch since the early 1930s.